Note to drivers who want to overindulge and drive anyway: If you are trying to avoid getting nabbed on a Los Angeles DUI charge, make sure that all the important parts of your vehicle are intact before you head down the road. If police spot you driving a vehicle without some vital part—like, say, front tires(!! )—they just may get suspicious and pull you over. To wit, Fox 32 in Chicago recently reported about the arrest of Marco A. Nieves, who hails from the northwest side of the Windy City. A police officer in the suburb of Riverside spotted Nieves around 4 a.m. on the morning of November 29th. Nieve’s car had heavy front-end damage and was missing the two front tires. Although Nieves allegedly had been traveling slowly, the metal rims of the car were throwing sparks. When the officer pulled Nieves over, the 46-year-old reported, in slurred speech, that he had been in an accident. Blood on his shirt seemed to confirm the story. Police, noting his glassy eyes and the strong smell of alcohol on his breath, gave him several field sobriety tests, which he allegedly failed. Nieves refused to take a breathalyzer test, however. Riverside police eventually charged Nieves with aggravated driving while under the influence, a Class 4 felony, with a misdemeanor charge of DUI and with driving with unsafe tires. He also faces charges of driving on a suspended license, since he lost his license in August. Nieves is no stranger to the justice system; he’s had multiple arrests for theft, assault, traffic offenses, burglary and damage to property. Police might also have charged Nieves with one more crime, leaving the scene of an accident. 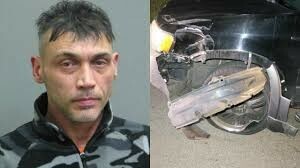 They tracked his movements before the arrest and found he had struck a pole in an intersection but took off without reporting the damage to anyone. It’s a good thing he didn’t hurt anyone, or else he might face charges similar to the ones laid out by CVC 23153, which among other things have the potential to elevate what might normally only be a misdemeanor DUI to a felony charge.